Microfinancing has grown significantly in recent years, helping lift communities and individuals out of extreme poverty. But what exactly is microfinance and how does it work? We spoke with Clara Lipson, Founder and Chief Executive of AboutMicrofinance.com and Member of the Board of the Microfinance Club of New York, to learn more about microfinance and its role in economic development. Q: To start, what is microfinance? Microfinance is the ‘provision of financial services to low-income people.’ Microfinance is a mission-driven practice for providing financial services and support to people without access.There are nearly 2.7 billion people globally who live on less than $2.00 a day without access to financial services. Microfinance is not just about loans or credit. It is meant to provide a full range of financial services to help low income individuals meet their household needs to generate income, build assets and manage risks. Q: How did microfinance start and how has it evolved? By some accounts the microfinance movement was started in the 19th century by social activists in Europe. But the modern version as we know it was actually formed in the 1950s and 1970s when governments and donors began focusing on raising incomes of poor households with microloans to start businesses. In the 1990s, some of these microfinance ‘programs’ transformed into microfinance institutions, gaining the attention of multi-lateral organizations, international financial institutions and investors who were drawn to the mission and to returns on investment. Today, there are some 1,500 microfinance institutions (MFIs) globally, comprising a $60 billion market, with more than 200 million micro-borrowers. MFIs, unlike traditional financial institutions, focus on lending money to the underserved and underbanked to help them handle lifecycle issues, family emergencies or other typical needs of low-income households. Q: Who is generally involved in microfinance transactions? A wide range of global participants are involved in microfinance transactions, including: funders (foundations, multi-lateral agencies), practitioners (non-governmental organizations, microfinance institutions), banks and increasingly mobile phone networks. Additionally, it is estimated that some $450 billion is sent home by migrant workers each year as remittances using microfinance networks, banks or money transfer agents. Q: What are some of the ways that people use their microfinance loans? People use microfinance loans for a variety of purposes. While microloans are intended primarily for starting or growing a business, many recipients use their loans for household consumption and investment. For example, microloans are used to pay for a child’s school fees, to put a new roof on the house, to repair a bicycle, and even to purchase food when hard times hit their household. Weddings, funerals, and healthcare expenses are also sometimes paid for by using microloans. Q: How does microfinance affect recipients? Microfinance not only benefits individual households but also communities. For example, as more parents are able to pay for a child’s education, the community can enhance its educational resources that benefit a multitude of children in that community. Income generated by a micro-entrepreneur can be used to purchase goods and services in the community thus leading to an improved business climate in the overall community. Q: What comprises microfinance? We have heard the terms microlending, microinsurance and microsaving. What’s the difference between them, and what should we know about each of them? Microfinance encompasses all aspects of financial services that deliver access to low-income, underserved people. These include loans, microinsurance, microsavings and other financial instruments. 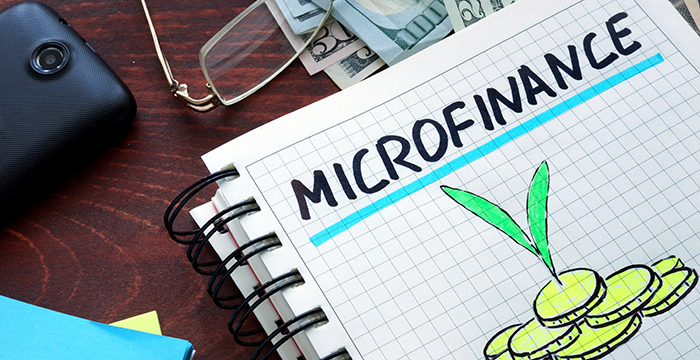 Microlending refers to small loans with specific repayment schedules and interest charges. These are usually utilized for business purposes so that cash flow generated from the business will pay back the loan. Microinsurance is a risk management tool. It is the same as regular insurance except that it is for low-income people, with low premiums and low caps according to their level. Microinsurance has proven quite successful, especially in helping mitigate risks often associated with agrarian loans when farmers face drought or other natural calamities that would hinder their loan repayment. Microsavings are meant to enable low-income households to pay for personal emergencies and build assets. Savings are placed in deposit-taking microfinance institutions, by participation in informal ‘savings circles,’ or mobile phone deposits. Q: How did you get involved with microfinance? I had been working in corporate finance at a Swiss bank, but was unexpectedly recruited for an opportunity to work in Central Europe in financial sector reform in the early 1990s. This completely changed my professional orientation and thrust me into the world of emerging markets. In 1993 I worked on a microcredit assignment in Malawi for the UN, and several years later decided to pursue that mantle. Subsequently, I founded AboutMicrofinance.com to serve as a portal for all things microfinance; and more recently expanded content to include financial inclusion and impact investing, which reflects a growing microfinance-inspired orientation. As an active board member of the Microfinance Club of NY, I also participate in organizing events and stay current on the microfinance ecosystem. Q: What has been the most rewarding part of working in microfinance? Providing information, resources and tools to practitioners and students alike that helps promote knowledge about the sector, addressing current topics that highlight challenges and opportunities in microfinance, and creating a global presence where followers from different regions of the world can readily access such information. Q: What would you say is the main reason for someone to get involved in microfinance? A sincere devotion to helping people at the bottom of the pyramid and a conviction that microfinance is a tool for helping people out of poverty (although it’s not a silver bullet). Microfinance is an important untapped market and by not serving this market we are witnessing economic and social repercussions globally. For that reason, concerned individuals and institutions have been responding by shoring up microfinance programs with grants, investments, and technical assistance. Q: What are the factors that people usually consider when figuring out what kind of microfinance project they want to help fund? It depends on the participants. For multilateral agencies and foundations, economic development and poverty alleviation are key factors. They look at MFI sustainability, policies, social impact, and delivery of financial services to clients. For private investors, considerations on financial returns are more relevant, although increasingly investors are also examining the social impact of their investments. In either instance, one should conduct due diligence of the project’s sustainability, management, policies, governance and impact outcomes. Q: What are some of the differences between the various organizations that facilitate microfinance transactions? Are they all not-for-profit? The majority of microfinance transactions are conducted by microfinance institutions (MFIs), which are not-for-profit and operate as non-regulated NGO-type of organizations. MFIs also include credit unions, cooperatives, and commercial banks. Digitization is becoming an efficient and cost effective method for money transfers and payments. Technology extends the ability of mobile banking to develop new delivery methods that serve low income populations in concert with existing financial institutions. Q: What do you predict the future of microfinance to be? These are exciting and important times in the microfinance industry. Several initiatives are emerging that will result in higher and better standards of practice. These include client protection, pricing transparency, and social performance. Tools have been created to better serve clients, investors and various other stakeholders. We will likely witness more top-tier MFIs transforming into regulated institutions or commercial banks, serving microfinance users as well as those who have graduated to small/medium entrepreneurs. Additionally, microfinance operators will find innovative ways to raise financial resources locally through deposit taking, raising capital from investors through Initial Public Offerings, and other funding instruments. The digital revolution will enable greater flow of transactions between microfinance practitioners and clients, along with the creation of new products and services to lower transaction costs and greater efficiency. Moreover, microfinance as a sector is evolving into financial inclusion, which is a more holistic approach to delivering financial services at affordable costs to disadvantaged and low income individuals/households. Microfinance providers aim to build the financial capability of this targeted population by motivating and supporting them in making sound financial decisions.